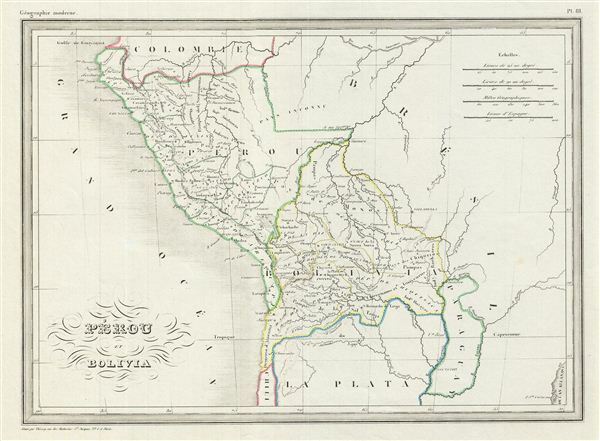 This is a fine example of Conrad Malte-Brun's 1843 map of Peru and Bolivia. It covers from Colombia to the Argentine Republic and from the Pacific to Brazil. Bolivia's claims to the Atacama Desert and Peru's claims to the Tarapaca region - both of which are today part of Chile, are shown. In 1841, two years before this map was published, the newly independent country of Peru invaded Bolivia only to be defeated. Bolivia consequently attacked and captured the Peruvian port of Arica. The war would eventually end in 1842 when both countries signed a peace treaty. Various cities, towns, rivers and other topographical details are marked, with relief shown by hachure. Boundaries are color coded according to regions and territories. This map was issued as plate no. 81 in Conrad Malte-Brun's 1843 Precis de la Geographie Universelle.